The international Spitzer Adaptation of the Red-sequence Cluster Survey (SpARCS) collaboration based at the University of California, Riverside has combined observations from several of the world’s most powerful telescopes to carry out one of the largest study yet of molecular gas – the raw material which fuels star formation throughout the universe – in three of the most distant clusters of galaxies ever found, detected as they appeared when the universe was only four billion years old. Allison Noble, a postdoctoral researcher at the Massachusetts Institute of Technology, led this newest research from the SpARCS collaboration. Results were recently published in The Astrophysical Journal Letters. Allison Noble, a SpARCS collaborator and this study’s leader, suggests several possible explanations: It is possible that something about being in the hot, harsh cluster environment surrounded by many neighboring galaxies perturbs the molecular gas in cluster galaxies such that a smaller fraction of that gas actively forms stars. 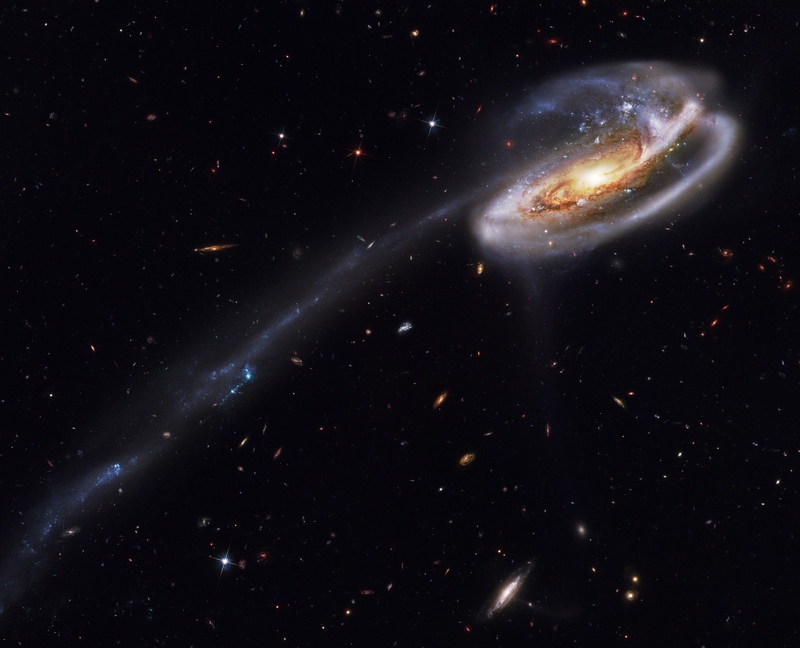 Alternatively, it is possible that an environmental process, such as increased merging activity in cluster galaxies, results in the observed differences between the cluster and field galaxy populations. Find the full text to the research paper here. The W. M. Keck Observatory findings were obtained as the result of a collaboration amongst UC faculty members Gillian Wilson (UCR), Michael Cooper (UCI) and Saul Perlmutter (UCB). The Hubble Space Telescope observations were obtained from programs led by Gillian Wilson (UCR) and Saul Perlmutter (UCB). The ALMA observations were obtained from a program led by Allison Noble (MIT). Other authors involved in the study were Michael McDonald (Massachusetts Institute of Technology), Adam Muzzin (University of York, Canada), Julie Nantais (Andres Bello University, Chile), Gregory Rudnick (University of Kansas), Eelco van Kampen (European Southern Observatory, Germany), Tracy Webb (McGill University, Canada), Howard Yee (University of Toronto, Canada), Kyle Boone (UCB), Andrew DeGroot (UCR), Anna Delahaye (McGill University, Canada), Ricardo Demarco (Universidad de Concepción, Chile), Ryan Foltz (UCR), Brian Hayden (UCB), Christopher Lidman (Australian Astronomical Observatory) and Ariadna Manilla-Robles (Australian Astronomical Observatory). Credit: The Tadpole Galaxy is a disrupted spiral galaxy showing streams of gas stripped by gravitational interaction with another galaxy. Molecular gas is the required ingredient to form stars in galaxies in the early universe. Credit: Hubble Legacy Archive, ESA, NASA and Bill Snyder.